One might think that knowing the end at the beginning would spoil a narrative, but Slimani manages to hold the reader in sinister suspense as the story of nanny Louise unfolds. As tragic as the story is, and as vile as the act is, Silmani cleverly keeps the sympathy with the perpetrator. The self-focused and sometimes guilt-ridden parents, their lack of gratitude for the person who facilitates their careers is a modern story with a very old history where children were handed to the nanny immediately after birth. The translation by Simon Taylor is excellent, but the continual reference to Paris [where this book is set in the French language] is jarring because it is a reminder that this book is indeed a translation. It would have been much better changed to New York or some other well-known English-speaking city. If you have young children and a nanny I would suggest you do not read this book because it will glue itself into your subconscious and make you fearful of a similar outcome. 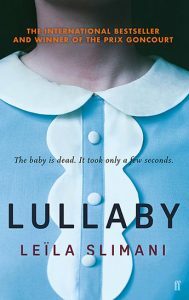 This is a small book, quickly read, and comes highly recommended if you enjoy a chilling tale told from an unusual perspective. please click here to read our privacy statement.